There are over 2 million apps available for download from the iTunes store and Google Play combined. It is unsurprising that some lawyers are utilizing available legal-specific apps on their mobile devices and tablets, creating portable law libraries. Although the majority of lawyers still have yet to download a legal app, a little less than half have—according to the American Bar Association (ABA) 2015 TechReport. After downloading and experimenting with over a dozen free legal apps, the following three are worth the time-investment. Fastcase is the most popular app for legal research, ranking higher than WestlawNext and LexisAdvance, according to the ABA 2015 TechReport. 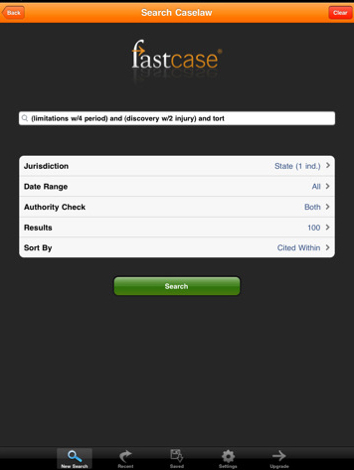 Although it requires a subscription, Fastcase is free to download and use. The app itself is largely intuitive; searches on Fastcase can be performed using citations, phrases, or keywords—including Boolean operators. Users can also browse statute collections by individually pulling up the state and selecting the desired code. Fastcase contains one of the largest selection of free Texas Codes. The app may be downloaded from the iTunes App Store for iOS devices and from Google Play for Droid devices. General Reference: PushLegal’s Statutes and Case Law Library. Created by a Houston, Texas trial attorney, PushLegal is free to use for anyone signing up with a school-issued email address. The app contains quick access to the Federal Bankruptcy Code, Rules of Civil Evidence, Rules of Civil Procedure, Rules of Criminal Evidence, Rules of Criminal Procedure, Sentencing Guidelines, and several other federal titles. PushLegal also contains Texas, New York, Florida, and California state codes, including the Family, Penal, Probate, Business Organizations, and Property Code. Searching is user-friendly on PushLegal. A search bar is located at the top of every screen, and various code sections also include a “Legal Cases” tab, listing cases that have recently referenced the particular statute. Provided by the Oyez Project, this mobile app contains the latest information on cases currently pending and recently decided in the Supreme Court of the United States. Minutes following the release of a SCOTUS opinion, it is reviewable on the app. Oral arguments and transcripts, along with decision summaries, are also accessible. Additional features, like polls, allow users to share their reactions to SCOTUS news.